KURDISTAN, ROJAVA ─ Young Kurdish girls and boys are reclaiming their playground, their childhoods and their future in Rojava (Western Kurdistan). With wooden toy weapons in their hands, they feel the responsibility to also participate in the ongoing struggle for freedom. They praise the People’s Defense Units (YPG) and resemble mini-versions of the women and men who are struggling to maintain a relative stability in a region marked by gruesome violence and so it is not surprising that they have become the idols and role models of these children. 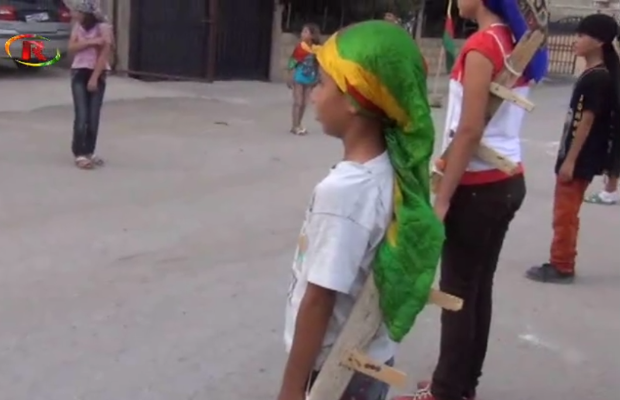 The children state that “as long as the YPG has our backs, we’ve nothing to fear”.